Happy New Year, everyone! For the entire week, we'll be doing a retrospective on The Amalgam Universe. 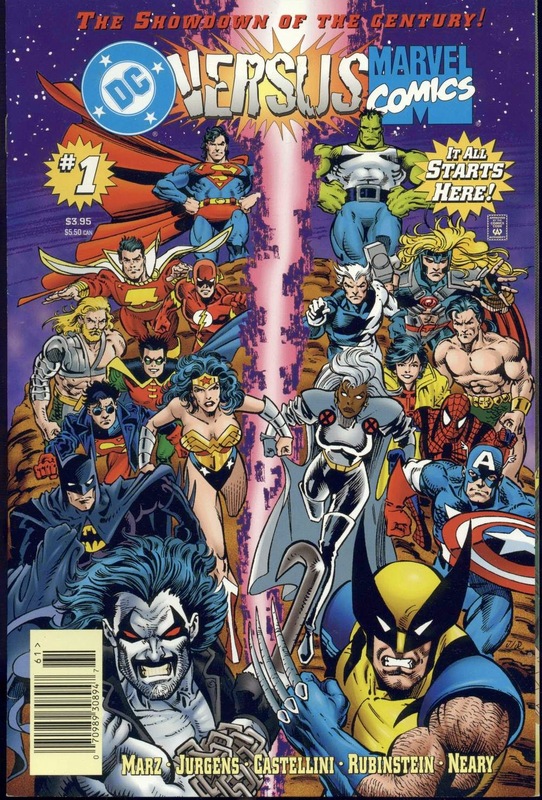 In 1996, DC and Marvel crossed over for a whole month in a four-issue miniseries entitled, appropriately enough, DC vs. Marvel. 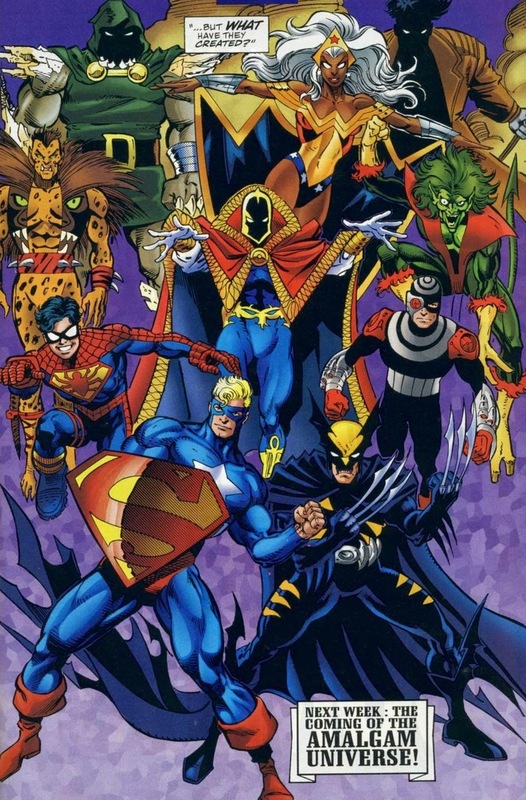 As an added treat, near the end of the crossover, Marvel and DC "merged" into one universe to create the Amalgam Universe, where every character was somehow a mixture of at least one character from each universe. There were 12 Amalgam titles, followed by another 12 in 1997. We'll be doing quick shots here! Likes, dislikes, things we don't get, and random thoughts for each Cuber. Read on! Due to mysterious portals, DC and Marvel characters are crossing over into the other universe, awakening the two cosmic Power Rangers/entities that represent each universe. In the centuries old battle for one entity to absorb the other and become whole, they decide to pit the champions of each respective universe against each other. (Round one seemed to be which universe could dress the worst.) The winning universe survives, the loser vanishes forever. Thor vs Captain Marvel, Thanos vs Darkseid, Aquaman vs Namor, Quicksilver vs Flash, Robin vs Jubilee, Silver Surfer vs Green Lantern, Elektra vs Catwoman, Wolverine vs Lobo, Wonder Woman vs Storm, Spider-Man vs Superboy, Superman vs Hulk, and Batman vs Captain America. Fans would vote on (some of) the winners. When the battle is over, instead of erasing one universe, they merge them into one, creating Amalgam. Ben Likes: The results of the voting making fans lose their minds. Jubilee barking up the wrong tree with Tim Drake. Ben Dislikes: This is the most ‘90s comic ever. Between Access, midriff Thor, and shirtless Aquaman, I’m pretty sure reading this made me sterile. Ben Don’t Understand: Why Spider-Man is going by Ben Reilly. That sounds like a stupid idea. Duy Likes: Spider-Man was pretty clearly (or if not, it comes off that way) meant to be Peter Parker for the story, since at this point in history Ben Reilly was blonde. But he still somehow does single-Spider-Man things, like hitting on Lois Lane, and Spider-Man beats Superboy with impact webbing. Maybe they got the memo after the first issue was out. Anyway, it's nice to see Ben. Duy Dislikes: The fact that I had to rack my brain to think about something to write in that previous paragraph. This crossover is pretty terrible. Duy Don't Understand: How what should have been the crown jewel of either company at the time seems to have been put together without any semblance of planning, coordination, or care. Amalgam comes off better than the actual crossover, and that shouldn't be the case, should it? Surest Signs the Times Have Changed: Superman's counterpart is the Hulk, who even gets top billing on the first cover. 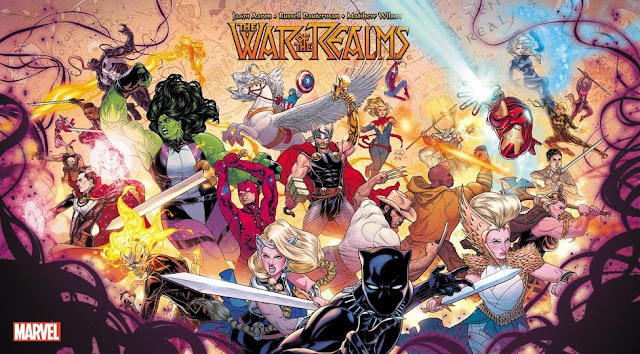 There's no way that isn't Thor now, nor is there any way Iron Man isn't involved in the top fights. Travis Likes: The concept. Some of the art. The X-Men stealing the batmobile. Robin and Jubilee in love. Travis Dislikes: The fights are weak and handled dumbly. All of them. Superman beats the Hulk by trying very hard. Namor gets a whale dropped on him. Robin takes out Jubilee without ever intending to hit her. Travis Don’t Understand: Why is X-Men merchandise big in the Marvel Universe? What Travis Would Have Liked: If one fight just went full on, I’d be happy. It’d change the game if Superman decided he might have to kill to save his entire universe, or if Hulk just rage-Hulked and smashed him down. If Robin pulled that “I can beat her without hitting her ‘cause she’s a girl” stuff and Jubilee just blinded him then nailed him in the face with her rollerblade wheels. Anything. If Lobo tore Wolverine up or vice versa. A fight, instead of dropping whales on a guy who can like a building or finishing a punch up off-panel; praying and then dropping a ferris wheel on them. Fight comic needed fighting. Matt Likes: Actually, the Joker and art once it goes to Gotham isn’t terrible. Matt Dislikes: So much to choose from...going with: Worst drawn Wonder Woman ever, not even comics-physically possible poses. Matt Don't Understand: Why I kept hearing people in the 90/00s cartoon voices. Dumbest Fight: The one I had with myself questioning why I kept reading. 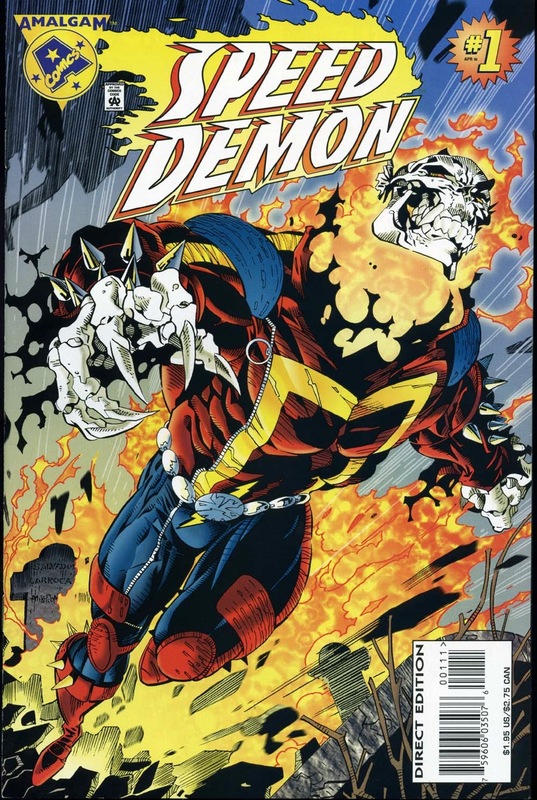 Blaze Allen is bonded to the demon Etrigan to become Speed Demon (Barry Allen Flash+Johnny Blaze Ghost Rider+The Demon Etrigan)! He has to free the soul of his love, Iris, from the clutches of the Night Spectre, but to do it he may need help from his nephew, Wally. Duy Likes: The Amalgams are so off the wall at first but they all make sense. Of course Etrigan would be bonded with Ghost Rider, and of course Marvel's at-the-time premiere legacy hero would be bonded with DC's at-the-time premiere legacy hero. Duy Dislikes: That, when in costume, the Green Goblin is still the Green Goblin, and out of costume, he's just Two-Face. Duy Don't Understand: How, given that I've never really liked Howard Mackie or Sal Larroca, that I still enjoyed this more than something like Amazon, done by one of my all-time favorite artists. Best Cliffhanger: Who is the demon Wally's bonded to? It's not Night Spectre, is it? Because that doesn't make sense. Let's see, he doesn't rhyme. So that leaves... Neron. Mephisto. The Phantom Stranger. I have no idea. I'm going to cheat and say Zarathos. Ben Likes: Salvador Larroca does a decent job on the art, despite what are nausea inducing costume designs. I needed some Pepto Bismol and a lucky rabbit’s foot just to finish this comic. Ben Don’t Understand: Just when I thought this comic couldn’t have gotten any worse, a wizard shows up. A wizard. Pointy hat with the stars, moons, and clovers and everything. Somebody is trolling me from the past. Matt Likes: I actually like the idea of mashing up Johnny Blaze and Barry Allen, even if in my mind I think of him as Jay Garrick. I also like the shoehorning of Mr/Ms. Miracle’s circus and switching Puck for Oberon (read Shakespeare people!). Matt Dislikes: I don’t like Etrigan’s text, it’s insanely hard to read and follow. Ghostriding or Ghostwritten: There is a lot of high falutin about souls and whatnot in this, but the stakes just don’t materialize. I feel the need, the need…: Oh, it’s Etrigan and Ghost Rider and Flash (for whatever reason). That makes a bit more sense than Speedy and Ghost Rider, even if there is less heroin going around. Travis Likes: The Guardian has a green flashlight sword. The total failure to combine Two-Face and Green Goblin conceptually. Arrowcaster shooting Speed Demon in the eyes as a starting move. Travis Dislikes: The total failure to combine Two-Face and Green Goblin conceptually. Travis Don’t Understand: Why Miss Miracle (combining Mister Miracle and Crystal) isn’t called Crystal Miracle. Which, is a better name. And who is Arrowcaster amalgamated from? Would Travis Buy a Miniseries: Yes. Our title assassins Catsai (Catwoman/Elektra) and The Dare (Daredevil/Deathstroke) take Arkham Tower floor by floor in pursuit of the crooked mayor of Gotham, The Big Question. Travis Likes: I love how Pat Garrahy’s colors separate and define Scott McDaniel’s art. Catsai’s transparent blouse. Jimmy Urich. That editorial cartoon of Strangefate puppeting the Big Question. Travis Dislikes: Catsai doesn’t seem like the sort of person to give herself a punny name like that. Dare bought it pretty quick, and her leggings are just a bit too much. Whole book’s a little too cheesecakey. The letters page runs a letter critical of the sexing it up back to back with one praising the title characters showing more skin, the first from a fictional dude who the responder (hypothetically the editor) says has his facts wrong, and the second from an imaginary woman who thinks showing more skin than a swimsuit helps on fight better or something. That’s disingenuous, at the least. Travis Don’t Understand: Why despite very valid points docked, I still really like this comic. Thing the Artist Went Out of His Way Not to Draw: A normal pair of shoes. Ben Likes: The Big Question has an appealing look, and a killer name. Ben Dislikes: McDaniel is hit or miss for me. Miss, here. Ben Don’t Understand: Why there are two Jimmy Olsen analogues. That’s two too many. Duy Likes: Everyone's said it already, but the Big Question. Duy Don't Understand: Why does Daredevil plus Deathstroke equal hot bikini chick? I like the Letters Page because: It's got one of the letters by someone named "Olav," and this isn't the only book that has it. Even Olav Beemer gets merged in this reality. Matt Likes: This comic starts off with a straight up murder. Downhill from there. Matt Dislikes: Apparently everything below, above and at the waist can’t be drawn in a way that represents a human body. Matt Don’t Understand: I don’t really know who was merged here. Catwoman? Elektra? Two other random people? WTF: I stopped reading after page 5, WTF is going on, who are these people and why should I care? I did like the Deadshot/Bullseye murder to start things at least. 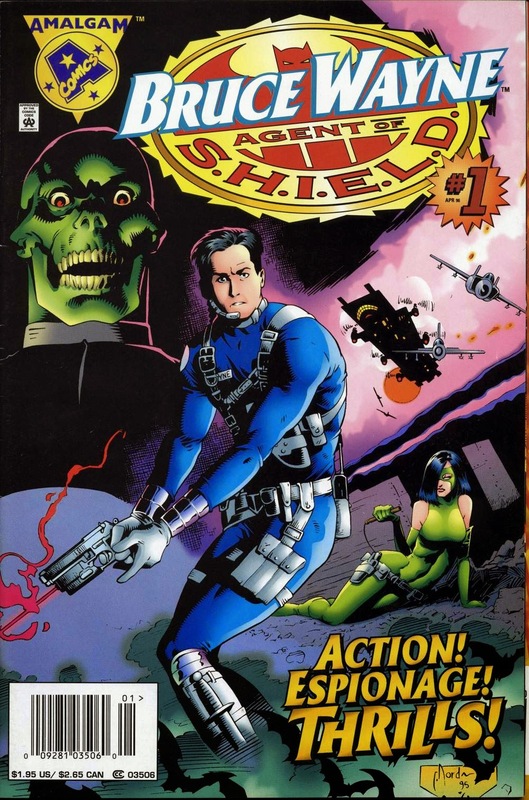 Bruce Wayne leads his elite espionage force against the menace of the Green Skull. Ben Likes: This is the first comic that didn’t make me want to kill myself for agreeing to do this. It did the best job of simulating a normal single issue in an ongoing series, seemingly continued from a previous issue, and to be continued into the next. Cary Nord’s art is the best I’ve seen yet in Amalgam, and the designs are atypically not-hideous. Nuke and Moonwing, in particular, were standouts in that respect. Ben Dislikes: The amount of anti-depressants I don’t have, but will need, to finish this event. Ben Don’t Understand: I guess Green Skull is Red Skull combined with Luthor, but why does that make him green? Kryptonite? Duy Likes: The fact that Cary Nord's art would actually look really good given today's production values and house styles. Duy Dislikes: The fact that Cary Nord's art isn't with today's production values and house styles. Duy Don't Understand: Who's the Green Skull? Is he supposed to be the Luthor we see in Super Soldier? Is he Luthor's son? Is he just some dude also coincidentally named Luthor? Best Evidence of Not Planning Things Ahead: Aside from the Green Skull thing, I meant. Tony Stark is in this book, head of Stark Industries. But in the second wave, Iron Lantern is revealed to be Hal Stark, head of Stark Aircraft. How does one no-prize this? Are they brothers? Cousins? Long-lost twins from other mothers? Travis Likes: Green Skull biting his tongue is funny. Bane with a Hydra tattoo on his chest. That doomsday gun is boss. “The Murder Gag” is a great title. Better than this issue’s title. Travis Dislikes: Nick Fury is still Nick Fury even though Bruce is half Nick Fury now. Tony really sinks into that chair of his. You’d think a genius could make a better chair. Was Chuck Dixon being paid by the description here? Stop with awkward adjectives and descriptions, please! Travis Don’t Understand: Why are standard Hydra agents in red and yellow, but the bosses are still themed green? Why is Bruce Wayne’s logo bat-shaped? Why is Babs blonde? Why do hairstyles change panel to panel? How do Moonwing’s eyes work? Retroactively Obvious Sudden Death: Deathlok buys it with several bullets through the torso, to be revealed as Jason “the Robin people called a hotline to have killed” Todd. Matt Likes: That is a good cover, I fear my disappointment. Matt Dislikes: Just too many mashed up people. Selina Luthor? Talia would make more sense with Viper. Over-promise, under-deliver? : Yes, yes it did. Moonwing? Lame. Bane Nuke dies the same way all the time. 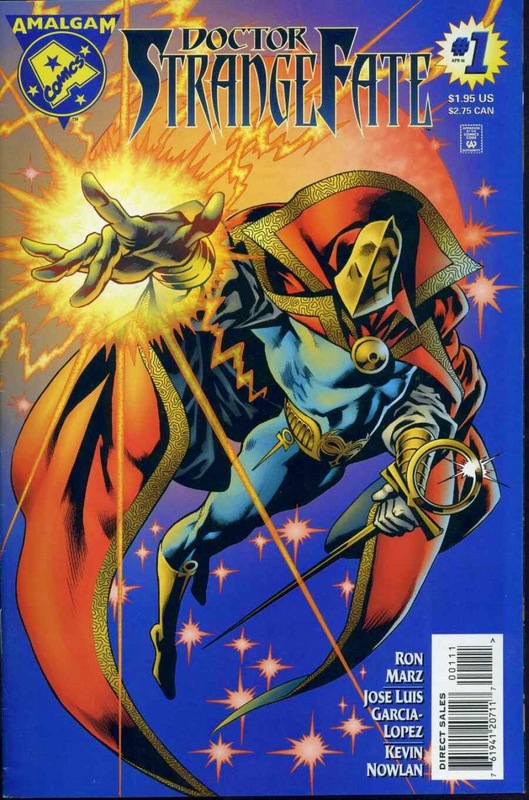 Dr. Strangefate sends a bunch of his agents to find Access, the new character created by both DC and Marvel to act as a bridge between worlds, to prevent the return of the Marvel and DC realities. Duy Likes: AH! What's not to like? Jose Luis Garcia-Lopez! Wanda Zatara, the White Witch! Bruce Banner is John Constantine is Solomon Grundy! Frankie Rayner, Jade Nova! Dr. Strange with Fate's helmet actually looks kinda good! Did I mention Jose Luis Garcia-Lopez? Duy Dislikes: That Access is in this. Duy Don't Understand: Is there something extra to Strangefate being Charles Xavier? That's just thrown in at the end for a twist, right? Best Easter Egg: I love JLGL's rendition of Strangefate's tower, complete with the sword used in Kal, the Elseworlds story that had Superman landing in medieval times. Ben Likes: Jose Luis Garcia-Lopez goes without saying, he’s a master. The combined look of Strange and Fate is arguably better than the real versions. Strange has that killer cape, and Fate the great helmet. (Dr. Strange and Dr. Fate are two characters I like in theory, if rarely ever in execution.) The White Witch was pretty great too, they could have stopped at her. Ben Don’t Understand: Why they had to go and ruin everything by making Charles Xavier the man under the helmet. Matt Likes: The artifacts add nice little touches, Superman’s sword, creepy Iron Man death mask, hammer of maybe Thor. Matt Dislikes: There seems to be a lot more Fate than Strange in this one. The art isn’t nearly crazy enough. Nabu is not going to like this one bit: Ah, the Amalgam Defenders. Except, a lot more derision, so probably like actual Defenders meetings. Travis Likes: Abominite, Strangefate, Wanda Zatara aka The White Witch, and every other amalgamation in this comic. The different and idiosyncratic body language JLGL has given everyone in every panel. Travis Dislikes: Too much Access as PoV. Travis Don’t Understand: Why is he Charles Xavier at the end? Shouldn’t he at least be Cain Marko? Inexplicably Gorgeous Costume: Dr. Strangefate’s. 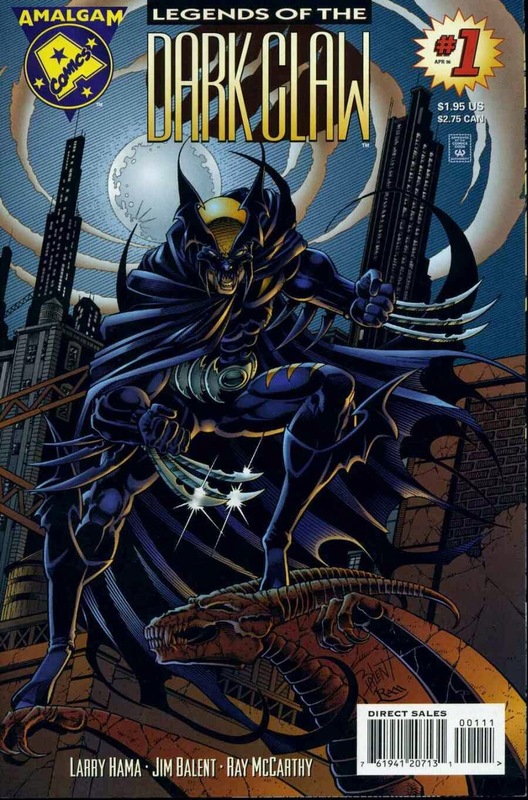 Can Dark Claw (Batman/Wolverine) and his allies stop the nefarious Hyena’s (Sabretooth/Joker) latest deadly scheme? Travis Likes: Sparrow (Robin/Jubilee) wants to be called Death Urge Overkill. Larry Hama’s Carol Danvers is always awesome and here, she’s half-Huntress! This is far more GI Joe than it is Wolverine or Batman, but it’s the best kind of GI Joe. Travis Dislikes: The letters page is way too self-congratulatory, in particular the fake letters purporting to criticize the talent. Balent doesn’t quite manage to illustrate the claws functionally, so Dark Claw’s body language never really lines up with what he’s supposed to cut. Travis Don’t Understand: Why is Dark Claw a painter? Best Avoiding a Portmanteau: Death Urge Overkill, aka Sparrow. Matt Likes: Jubilee as Frank Miller’s Robin actually is a really good visual. Matt Dislikes: The Batman/Wolverine mashup. It just doesn’t work. The characters aren’t similar enough. Bruce/Nick Fury works better. Batman/Ironman would work better too. Who thought this was a good idea? Larry Hama apparently. I lost interest after 7 pages. I hate the Frank Miller/AzBat times. How my childhood was ruined: I love the 90s BTAS cartoon, this is everything that’s pretty bad about 90s comics rolled into one. All of the cliches are here, well, maybe not ridiculous numbers of pouches. Ben Likes: Carol Danvers as the Huntress. Jubilee as Robin analogue Sparrow. Larry Hama. Ben Dislikes: Wolverine crossed over with Batman doesn’t quite work for me. They’re both relentlessly grim these days, but something about the pairing seems incompatible to me. The Hyena looks ridiculous. Larry Hama’s puns. Ben Don’t Understand: Carol Danvers as the Huntress. Duy Likes: This is my favorite Amalgam title, despite not having any of my favorite source characters or creators. It's just the most entertaining, as far as I'm concerned, and it does remind me of why at one time I cared enough to check out whatever Jim Balent was working on. Duy Dislikes: The fact that I must have read this apart from all my other Amalgam comics at one point, that now I can't find it. Duy Don’t Understand: How this is my favorite Amalgam title, despite not having any of my favorite source characters or creators. 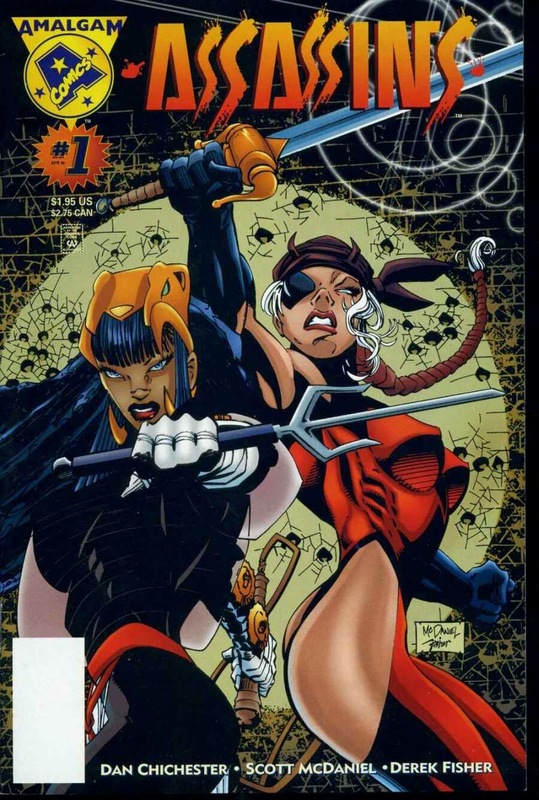 Best "We had to merge them somehow" Amalgam: Carol Danvers, the Huntress. Go to Part 2, Part 3, Part 4, and Part 5!